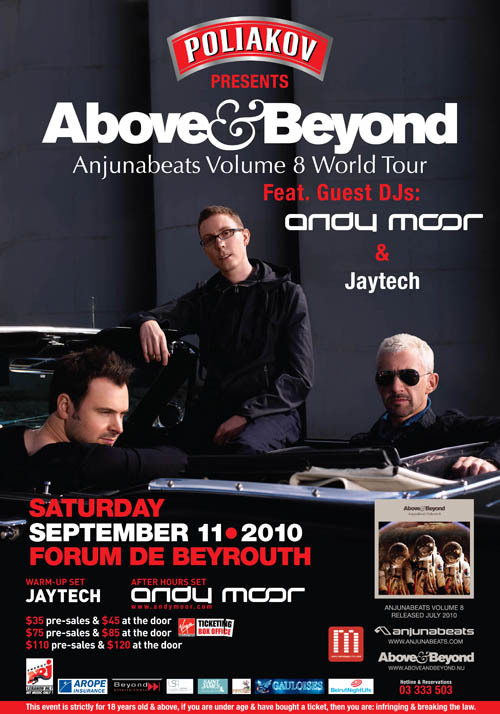 Poliakov proudly presents, the World’s Biggest Trance trio DJs/ Producers ABOVE & BEYOND Anjunabeats Volume 8 World Tour (2010). There are DJs who can rock a party, a club, a festival. And there are acts that can write songs that will bring out the goose bumps in you. But there’s only one group that can do both: Above & Beyond. From remixing Madonna (2001), to winning Essential Mix of the Year (2004) or playing to one million people on the beach in Rio de Janeiro (New Year’s Eve 2007), Above & Beyond’s career has been a constant upward curve since the trio formed in 2000. Creatively and geographically, Above & Beyond don’t believe in borders. Hence 2009’s full live band show in Beirut, Lebanon. “What an undertaking,” says Tony. “We decided to do a really big, high production live show. It was an enormous undertaking and a risk.” It was the first time they had translated the Above & Beyond sound to a live line-up – drums, bass, guitar, keyboards, singers Zoe Johnston and Richard Bedford. “People were blown away and we felt blown away by it ourselves,” says Tony.”” And Beirut left its mark. The next major project is the new Above & Beyond studio album – currently scheduled for Autumn 2010, their first since ‘Tri-State’ and in its finishing stages. Which is why even when they are half a world away, audiences always make Above & Beyond feel at home. Despite his relative youth, Jaytech’s prodigious creativity and prolific work rate (he started producing at just 14 and released his first track at 16) have seen him rise up as the most consistent artist on the popular Anjunadeep imprint . Grammy-nominated Andy Moor is an icon in the electronic dance music industry. Undeniably one of the most respected producers in the genre whose substantial talents and work ethos have earned him a catalogue of accolades. Recently nominated for the 2009 DJ Awards, Andy is currently rapidly scaling the DJ Mag’s Top 100 @ 15th. Named Best Trance Producer and Best Trance Track at the 2004 Trance Awards, Best Dance Record at the 2006 International Dance Music Awards, Andy received his Grammy nod with a magical remix of Delerium-Angelicus in 2008. His producing and remixing magic has already set fire to the work of celestial artists Britney Spears, Avril Lavigne, Paul Oakenfold, Brian Eno, Tiesto, Arthur Baker and Nadia Ali, to name but a few. Andy Moor’s last remix, Nadia Ali – Love Story soared to the climatic #1 spot on Billboard Breakout Chart, the Billboard Dance Chart and Beatport Trance. Up next is the highly anticipated follow up Delerium remix, released on the self-titled album early 2010. A new mix compilation series, Breaking the Silence has just been released on his own record label AVA recordings, capped by a world tour. A landmark on the tour scene, Andy mesmerizes clamoring EDM fans with his technical ability, turntable skills and creativity. Mixing with a white-hot sense and individual style, it’s not difficult to understand why Moor’s talent is so much in demand. Out of stillness, Red Bull Awakens the Grotto!